IT Operations teams in enterprises everywhere are being asked to provide Kubernetes infrastructure to help drive delivery of today’s modern, container-based applications. But where to begin? Much of the information about Kubernetes today has to do with how to use the platform; very little addresses the concerns of those of us who need to stand up and manage a Kubernetes environment itself. At SUSE, we’ve noticed. And we’re more than ready to help. 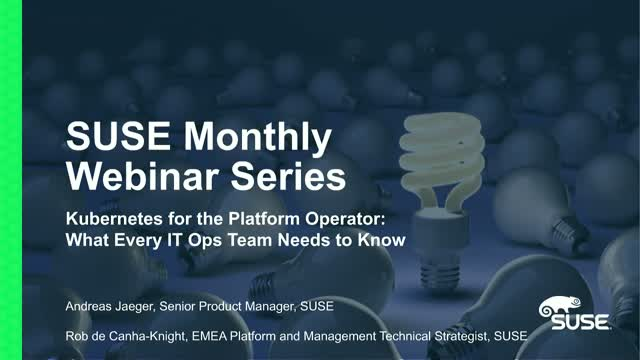 SUSE invites you to explore Kubernetes from the operator’s point of view in this webinar series. We’ll discuss platform installation and configuration issues, platform security, and platform maintenance concerns. Learn about monitoring and scaling Kubernetes, and managing its availability. How is Kubernetes changing and maturing, from an operational perspective? Join SUSE and discover what every IT Operations team needs to know going into the world of Kubernetes.